Cedrus atlantica ‘Glauca’ and boxwoods. 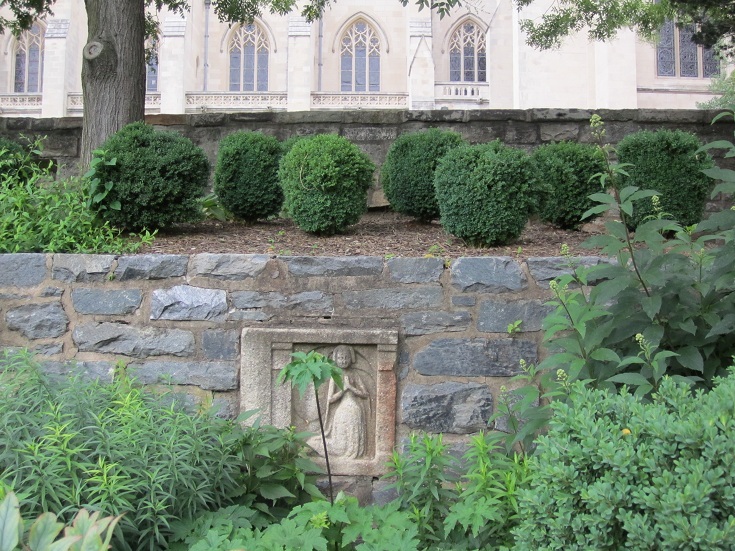 I spent yesterday morning at The Bishop’s Garden of the National Cathedral. I’m embarrassed to admit that I had never visited this popular Washington garden before. I’m sorry I waited so long. The place has the beautiful patina of an old piece of silver. The partially walled space was designed by Frederick Law Olmstead, Jr. as a private garden for the Bishop. But in 1916, Florence Brown Bratenahl, the wife of the Dean, took over the garden’s installation and re-worked the plan for public access, opening it in 1928. She was the cathedral’s Landscape Designer from 1927 to 1936. Today, the garden is maintained by the All Hallows Guild, which Mrs. Bratenahl founded. 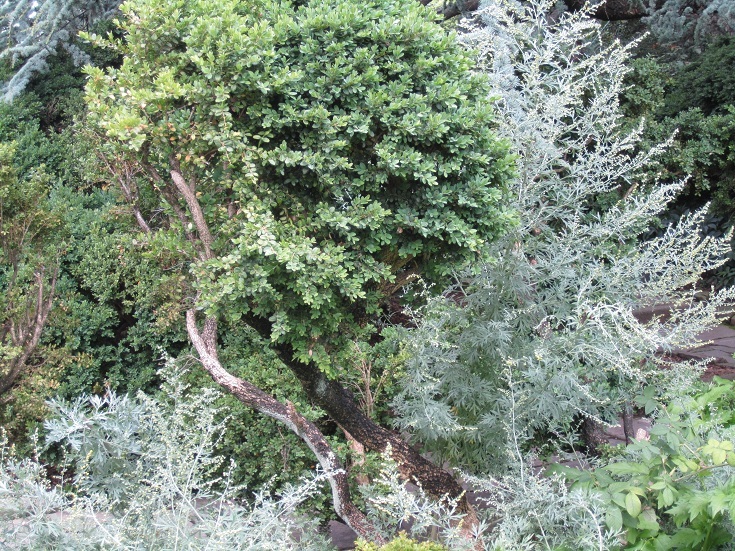 An old boxwood and companion plants. The garden sits on the south side of the cathedral immediately off an access road and parking area. One parking space actually blocks a bit of the Norman-style arched entryway. On stepping inside, however, you are immediately enveloped by the long branches of an old weeping cherry and encounter the first of many antique boxwoods. Younger boxwoods grow in a bed set on a higher tier of a wall with 15th c. bas relief. In the 1920s, Mrs. Bratenahl brought in mature boxwoods from George Washington’s Hayfield Manor, from the Ellersbee Plantation in Virginia, and from other historic sites in the region. I wasn’t able to discover from online research how many of the current bushes are from this time. This lovely garden contains almost every shade and shape of green leaf, set against aged bark and moss-grown stone — all beautifully punctuated, but not overtaken, by the flowers of old-fashioned perennials, annuals, and herbs. My only real reservation about the design was the central rose garden, which I think has too many brightly colored, glossy-leafed hybrid teas. I would prefer to see bushes with more subtle appeal and interesting foliage. The fact that the south side of the garden is open to a parking lot for St. Alban’s School is really too bad as well. In Olmstead’s original plan, I believe that area merged into woods and a stream. However, one of the gardeners working there told me that there are plans to put in some kind of view barrier, probably a tall hedge, possibly as early as this fall. Please enjoy the gallery below. Click on any thumbnail photo below to scroll through all the enlarged pictures. The 1926 plan for the garden. Perennials growing through an old boxwood. Old open boxwood with perennials growing at the base. Norman Court, a fountain designed by Florence Brown Bratenahl. Another view of the cedar and boxwoods. Rudbeckia maxima in the upper perennial bed. Younger boxwoods grow in a bed set on a higher tier of the upper wall with 16th c. bas relief. Goldfish in the pool of St. Catherine. I like the rusty orange tint of these coreopsis. Pomegranate and parsley. Would make a good name for a blog. What is the name of the tree? I just cannot remember. 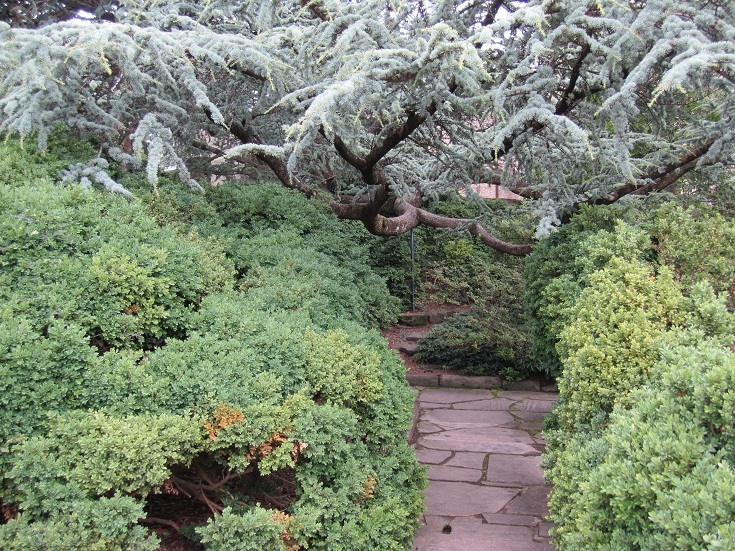 The pattern of the stone is echoed by the variety of sages planted along the yew walk. The cathedral and Russian sage. The lower perennial bed. The center “tree” is an enormous yew. Closeup of the old yew. The Hortulus (Little Garden) with its herbs and Carolingian stone font. New plants. I like it that the gardeners only lightly mulch the beds. I felt like I got a tour of the garden through your photo gallery. Your photos are so poetic and seem to harken back to another time when the garden was founded. Thank you! What’s interesting about this garden is that it was partly old from its start. If you click on the link on All Hallows Guild, you get their website. Scroll down and there is a link on a little booklet by Mrs. Bratenahl. She was bringing in all sorts of large mature shrubs and trees. Aside from the wish of every gardener to bypass those first 3-10 years of adolescence in a new place, I wonder if this was influenced by the popularity of the then-new Williamsburg and the colonial revival style — a focus on authenticity and heritage. Also, she must have garnered real bragging rights in the landscaping community by successfully moving such large trees. I would love to find out more about Florence Bratenahl. There wasn’t too much on the internet; I’ll have to visit the library. Next time I visit the B.G., I’ll also ask the gardeners which of the boxwoods are original. I have thoroughly enjoyed touring this lovely garden with you. Your description -“he place has the beautiful patina of an old piece of silver.” – roped me in and I sat here and just lost myself in your wonderful pictures. Thankfully, I remembered that clicking on them gets you to an enlargement and they are indeed beautiful, each and every one of them. Thanks so much for taking me along on the tour! I’ve been to Washington several times as a tourist and I am embarrassed that I have never visited there either — I will definitely have to pay a visit in the future! Thanks so much! I have been out having the most frustrating day, and this makes me feel so much better. 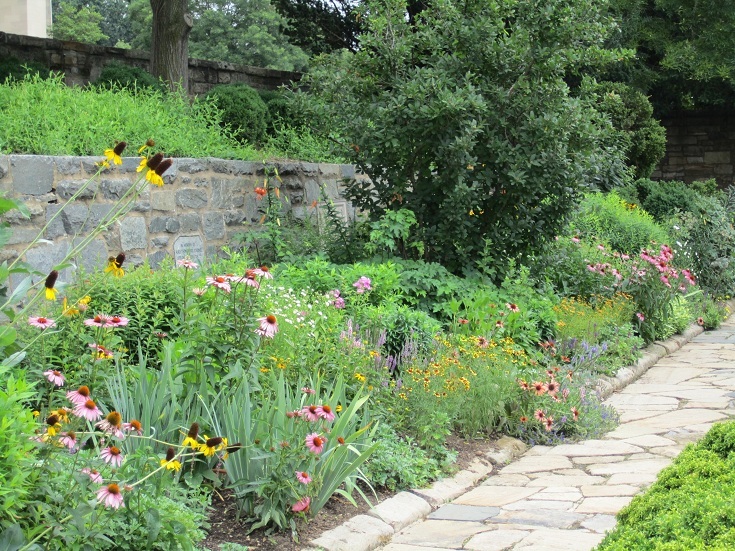 I you visit the Bishop’s Garden and are on public transport, take a cab from the Dupont Circle or Woodley Park metro stop (you can easily hail one back later) or take any of the 30-something buses south from the Tenleytown stop. There are a few nice casual restaurants and a Starbucks about 1 1/2 blocks north of the cathedral.